The first American historian to chronicle everyday life of the colonial era, Alice Morse Earle conducted years of research, based on letters, official records, diaries, and other accounts. 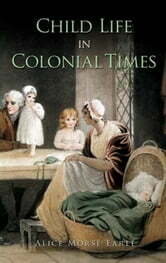 A vivid portrait emerges, depicting a child's world of hornbooks and primers; lessons in manners and religion; methods of discipline; and toys, pastimes, and other amusements. The author offers a broader perspective by comparing conditions in America with those of England. More than 120 illustrations include reproductions of images by the era's finest artists, including Copley and Peale. "The book is one of historical interest and value," declared The New York Times, praising it as "beautifully illustrated [and] a charming book for old or young."